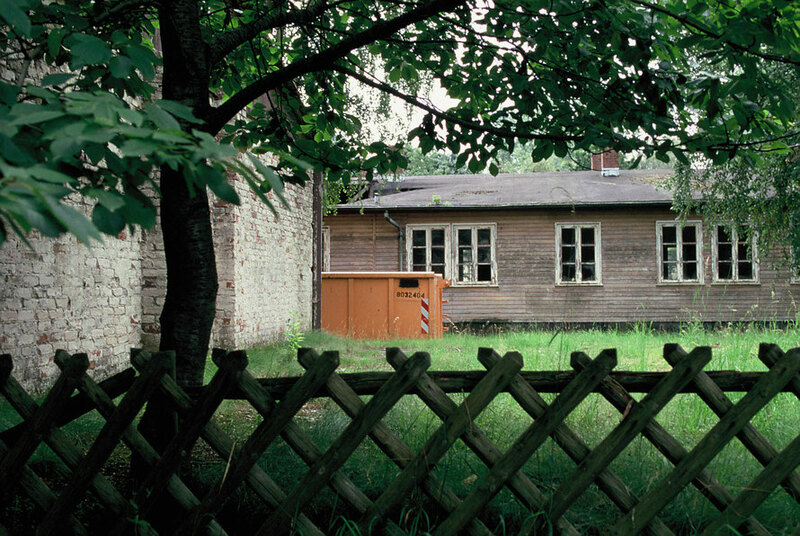 The difference between specifically labelled places of public remembrance and those former Nazi camp sites that have been put to other use has been deliberately blurred in the way these photographs are compiled. The photographs do not show artefacts which immediately invite remembrance, such as gravestones, memorials or sculptures. The photographs do not depict architectural fragments such as fences, watchtowers, railway tracks etc , which are embodied in our collective memory as symbols of National Socialism and the Holocaust. The composition of the images avoids any elements of traditional iconography. Instead, traces of structures have been included which appear to be loaded with as little meaning as possible. The increasing disintegration of the iconography can be read from the photographs, which move from representational images to pictures of areas and surfaces. The photographs were taken in colour and during the summer. Links to the present time are shown. The analogue technology and the full-size enlargements without cropping refer to the particular character intrinsic to photography.